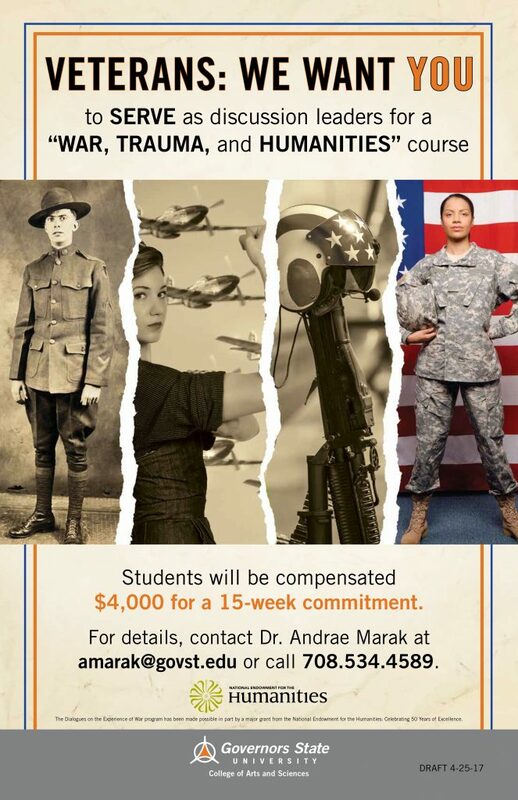 As an update for my upcoming work on a National Endowment for the Humanities grant (Dialogues on the Experience of War), I wanted to share with you all the very cool poster promoting the new college course for this fall. The course will be given at Governors State University, located in Chicago, and is overseen by Dr. Andrae Marak. The goal of “War, Trauma, and the Humanities” is to promote a greater understanding of the impact war and trauma has upon veterans. Students will learn about this important topic through literature, film, and group discussions with veterans. This interactive and multi-disciplinary course will conclude with a televised town hall discussion involving students, veterans, and members of the public. My contribution to the course will be to lead a discussion on oral history interviews of veterans as evidence of trauma as well as to educate students on oral history interview techniques. Feel free to contact me (patrick@makehistoryproject.com) if you would like to learn more about this course, or if you would like to participate in future projects involving this topic.